In what ways do the three main male characters in &quot;A View from the Bridge&quot; demonstrate differing kinds of Masculinity to the audience? In what ways do the three main male characters in "A View from the Bridge" demonstrate differing kinds of Masculinity to the audience? Eddie Carbone is a longshoremen, he lives in Brooklyn with his wife, Beatrice and his niece Catherine, who he has brought up since her mother has died. Eddie loves Catherine more than a niece; he wants to keep her as a child forever so she will never leave him. Beatrice's cousins (two Sicilian brothers) arrive at Eddie's apartment, it has taken some time to get them into the country and they must not be known by the Immigration Bureau or they will be deported. At first Eddie likes Marco, the oldest of the brothers, because of his attitude to making money to send back to his family. Something that a "real" man should do, look after and protect their family, this is the same reason why he dislikes Rodolpho because he doesn't act the way a "real" man does and is unmarried (afraid that he might take away Catherine). Things start to go wrong for Eddie after the arrival of Marco and Rodolpho, Catherine starts to go out late at night and Eddie disproves of this and when he knows that Catherine and Rodolpho are going out with each other he is furious and dislikes them together because he doesn't like the way Rodolpho acts. ...read more. "Beatrice: Why! What do you want?" "Eddie: I want my respect. Didn't you ever hear of that? From my wife? Eddie demonstrates the type of man he is to the audience during the whiskey bottle scene. In the scene it shows that he enjoys drinking (which is usual for a man in this time period), it also tells the audience that he is trying to drown his sorrow and that he likes Catherine which he is stressed about because he is afraid that Rodolpho would take her away from him. Marco is strong but silent unlike Eddie who thinks that you need to show off your strength to prove how manlike you are. This is shown to the audience through the scene where Eddie hits Rodolpho during the boxing match. Marco is more like Eddie than he is like Rodolpho, i.e. Eddie and Marco is both driven by their beliefs and protective of their family. The most important thing to Marco is his family back in Scilly; he has come all the way from there to America only because he can't earn enough money to support his children. Honour is also very important to Marco, which is way he kills Eddie in the end for telling on him to the immigration bureau. All these things about Marco are demonstrated to the audience by the way he works and the fight between him and Eddie at the end of the play. ...read more. and was considered as a woman's. Catherine likes Eddie but only because he has brought her up and looked after her, because of this she feels that she must be responsible and stay by his side and obey his commands. While she likes Rodolpho because he is young attractive, different from Eddie and has travelled far and wide around the world, where she has only stayed in Brooklyn for her whole life. Masculinity is important to the play because if any characters behaviours where different then the play would have changed dramatically. E.g. 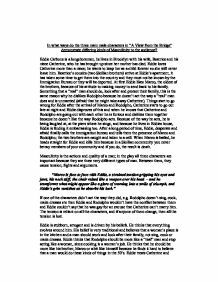 if Eddie didn't love Catherine, then he wouldn't have told the immigration bureau about the two Sicilian brothers and if this never happened, Marco wouldn't have needed to seek revenge. In the end the real man is probably Eddie because he died for what he believed in but Marco could be considered as the real man because he too stood up to what be believed in and killed Eddie and also protected his brother when Eddie hit him. In the end, I think that the audience comes out thinking that Eddie and Marco are the "real man," this is probably because that they both stood up to their beliefs and Eddie even died for what he believed in. Although people may think that Marco was wrong for killing Eddie, all he was doing was following his Sicilian unwritten code of honours. ...read more. be willing to accept that he is the controlling voice in the household, for example when Catherine is offered her job she will not accept it unless Eddie is happy with the situation, but in this instance Catherine argues with Eddie about Rodolpho and will not abide by his ruling, which undermines his authority even more. school, because he knows that if she goes to work she will meet new people and Eddie is scared that he will lose her and also because he feels threatened by this. In this extract there is another example of Eddie's manhood because he believes that he should have been consulted first. looses these characteristics and so is seen as less masculine, he looses his pride, authority, leadership he looses the control of his house hold and he looses his respect. 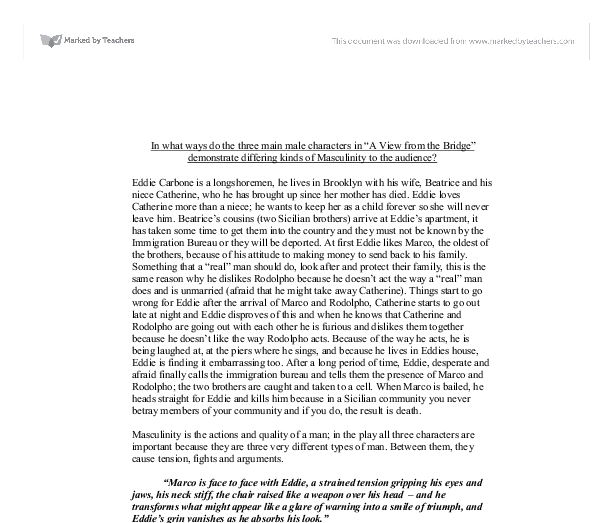 In act one of the play masculinity is shown in many different ways, a good example being Eddie carbone. Eddie values his name, he values his name so much that if anything happens in or outside the house Eddie feels as though his name is in danger. Eddie is a well-educated man who studies and respects the American Law, but is also loyal to the Italian customs. But John Proctor stated that " I have hardly stepped off my farm this seven month" by saying this he is trying to revoke what Abigail said and try to rebuild his marriage and relationship with his wife. Abigail was the servant girl for the Proctors, but while she was in their service she had an affair with John Proctor.